Rev up your roasts or pie toppings and add a savoury kick to sausage roll recipes with our freshly crumbed sage and onion stuffing. 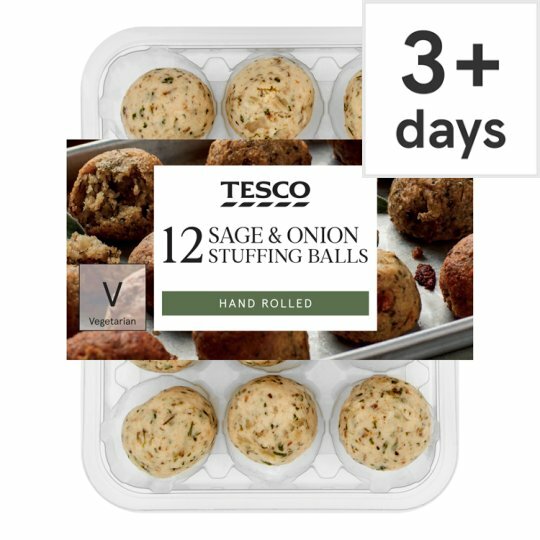 A traditional sage and onion blend with butter, onions and specially selected herbs rolled into balls and ready to use. Get Sunday lunch sorted with our Real Food recipe for Roast chicken and all the trimmings. INGREDIENTS: Wheat Flour (Wheat Flour, Calcium Carbonate, Iron, Niacin, Thiamin), Water, Onion (22%), Butter (Milk), Rapeseed Oil, Salt, Yeast, Parsley, Thyme, Sage (0.2%), Rosemary, Basil, Pepper, Marjoram, Oregano, Flour Treatment Agent (Ascorbic Acid). Keep refrigerated., Once opened, keep refrigerated and consume by "use by" date shown., This product may have been previously frozen and restored to chill temperatures under carefully controlled conditions. Defrosted: It is still suitable for home freezing. Instructions: 220°C/Fan 200°C/Gas 7 18 mins Place balls on a baking tray on the middle shelf for 18 minutes, turning half way through cooking. Defrost thoroughly for a minimum of 4 hours in the fridge. Follow the preparation guidelines above.